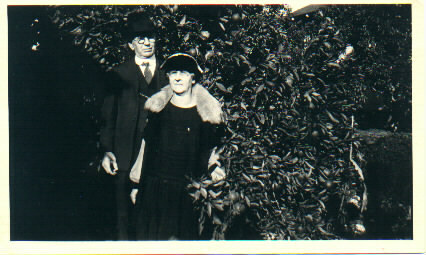 Comments: Burtis and Amrett Hoag (Nee: Van Wyck) | Whittier CA USA | 1921-1940 | Comments: The photo probably was taken outside my great-grandparents' home at 313 E. Penn St. Whittier CA c.1930-40. They look like they have just come from church. In the early 1940s their house was eminent domained for the Whittier city hall, so they lived their remaining years in Santa Monica/Venice CA with a daughter, Myrtle Hoag Brooks and son-in-law Guy Brooks.